Paul Longley is Professor of Geography at the Department ofGeography, University of Bristol, United Kingdom. Michael Batty isProfessor of Spatial Analysis and Planning at the UniversityCollege London. United Kingdom. Paul Longley is a professor with the Department of Geography, University College London, UK. 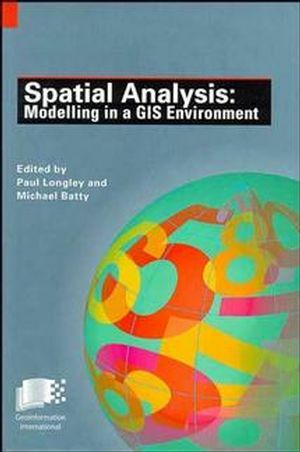 Analysis, Modelling, Forecasting, and GIS Technology (P. Longley& M. Batty). New Evidence on the Modifiable Areal Unit Problem (M. Green &R. Flowerdew). SCALE AND GENERALIZATION IN GEOGRAPHICAL ANALYSIS. Depicting Changing Distributions Through Surface Estimation (D.Martin). Visual Interactive Locational Analysis (P. Densham). Retail Location Modelling in GIS (M. Birkin). Directions and Opportunities in Spatial Econometrics (L.Hepple). Integrating Dynamic Spatial Models with GIS (B. Mikula, etal.). Visualizing Urban Dynamics (M. Batty). Analytical GIS: The Future (M. Batty & P. Longley).